As a young boy, Dickey D., sat four seats from the front in his 7th grade history class struggling to see the board. He recalls his teacher looking at him and saying, “Boy, you need glasses!” He remembers going to have his first eye exam and receiving his first pair of glasses. Thinking back on that day, Dickey said, “I was amazed at what I could see.” Years later, after cataract surgery, he reminisced on that exact feeling. Though Dickey had been wearing glasses and contacts since the 7th grade, he noticed his vision had started to deteriorate over the years. He noticed year to year that his vision was getting worse and glasses were no longer satisfying his visual needs. Dickey struggled to read the newspaper and sing along to hymns at church, so he went for his annual eye exam where he was diagnosed with cataracts. Choosing his cataract surgeon was easy. Dickey previously had LASIK eye surgery with Dr. Kerry Solomon and was satisfied with the wonderful results he had experienced. Dickey expressed feeling “really good about coming back” to Dr. Kerry Solomon for his cataract surgery since the two had a medical history. Together, Dr. Solomon and Dickey decided to proceed with laser cataract surgery using the LenSx and ORA advanced technology to give Dickey the best possible distance vision after surgery. Since his procedure, Dickey is “amazed” at what he can see again. He said, “Not only the objects that I can see, but the vivid color that comes with removing the cataracts”. It is like being back in 7th grade when he walked outside with his first pair of glasses, he said. Dickey is looking forward to life with clear vision. One thing he is looking forward to most is being able to see the fish again when he is flounder gigging. 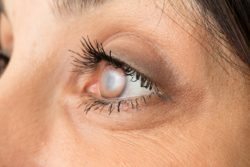 If you have been diagnosed with cataracts and your vision is impaired, it may be time for cataract surgery. To learn more about cataract surgery, please schedule an evaluation with board certified ophthalmologist Dr. Kerry Solomon. Contact our office by calling (843) 881-3937 or filling out an appointment request online.